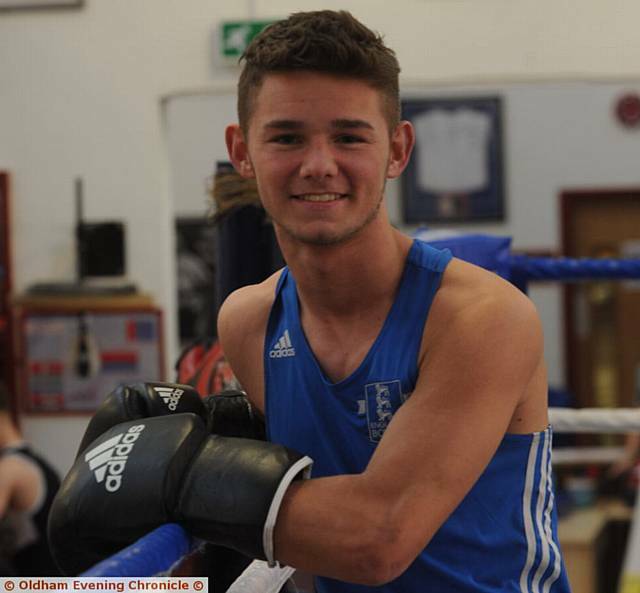 OLDHAM’S England Boxing Elite champion Will Cawley has been selected for GB Boxing’s funded Podium Potential squad, meaning the country’s top coaches clearly feel the 18-year-old is capable of securing future Olympic glory. Cawley, who trains at the Oldham Boxing gym under the tutelage of Eric Noi, received confirmation by letter and will meet up with the GB squad for the first time in Sheffield between June 23-26. Cawley, who won the English Elite title in the 52kg category at Liverpool’s Echo Arena last month, will now be guided under the GB banner for three months, at which point a decision will be made on whether he earns further elevation to full-on ‘Podium’ status. He may have missed out on selection for the Rio Olympics this year, but it now appears that further showpiece events and tournaments will be on Cawley’s radar. “I’m going to be flying all over the world now,” added Cawley. “The GB set-up will be putting me in for some great tournaments – if I make it on to Podium status you get to enter the World Championships and things like that. “I’m confident that I’ll make the step up after these initial three months, but for now I’ve just got to knuckle down and work hard during the training camps. Cawley underwent a number of in depth assessments before the GB coaches offered him a Podium Potential place, while the English title win will surely have helped make up minds. Meanwhile, Cawley’s trainer Noi and his Oldham Boxing Gym colleagues are altering the theme of their forthcoming star amateur show, which is to take place at the Oldham Leisure Centre on Saturday week, June 18. Some future Olympic hopefuls will still be on show, but instead of a ‘Oldham vs The Rest III’ showcase, the night will now act as a tribute to ‘the Greatest’ – Muhammad Ali – who sadly passed away at the weekend. Noi said: “We figured it appropriate to change the theme of the evening.